Organic. Ginger is a well known herb used in cooking and medicine across Asia for centuries. Our organic ginger powder can be used in cooking or raw food to add some spicy warmth and health benefits to your gingerbread men or your smoothies. Origin India. Ginger is one of nature’s most versatile ingredients. Often used to cure and help upset tummies or motion sickness it’s also a common ingredient in cooking. Aromatic, pungent and spicy, ginger adds a special flavor and zest to Asian stir fries and many fruit and vegetable dishes and your juices. Fresh ginger root is available year round in the produce section of your local market. Ginger is the underground rhizome of the ginger plant with a firm, striated texture. The flesh of the ginger rhizome can be yellow, white or red in color, depending upon the variety. It is covered with a brownish skin that may either be thick or thin, depending upon whether the plant was harvested when it was mature or young. It’s flavour is aromatic, spicy and hot. A great addition to your food if you want some warmth and spice! 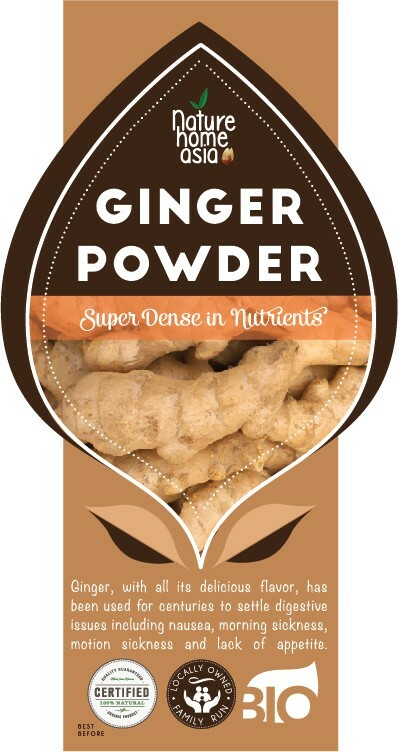 Ginger reduces all symptoms associated with motion sickness including dizziness, nausea, and vomiting. 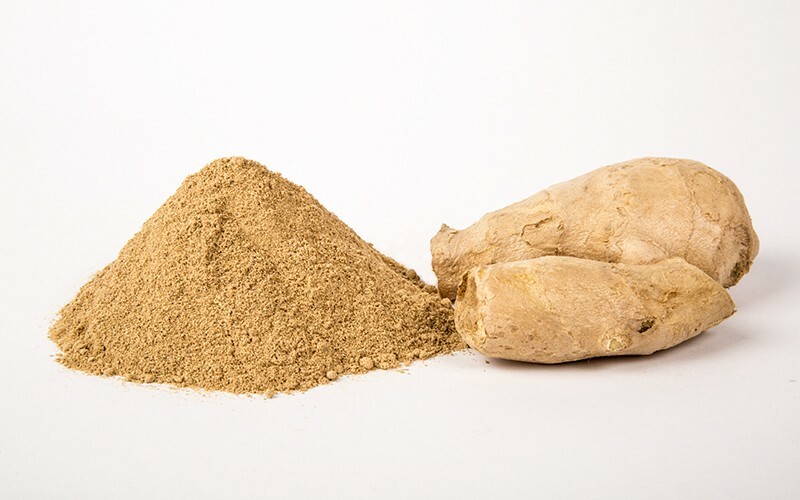 It’s also very useful for women with morning sickness, ginger's has been shown to be very useful in reducing the nausea and vomiting during pregnancy. Ginger can not only be warming on a cold day, but can help promote healthy sweating, which is often helpful during colds and flus. A good sweat may do a lot more than simply assist detoxification. German researchers have recently found that sweat contains a potent germ-fighting agent that may help fight off infections. So if you’re feeling under the weather make some ginger tea or add some to your juice or smoothie. Ginger works brilliantly in both sweet and savory food. From Asian dishes, stir fries, juices and smoothies. Cakes, pies, cookies and puddings... go mad with ginger and adjust to your heat levels as it can be spicy to the tastebuds if you add too much but always good for your tummy. Simple, powerful and effective and a sprinkle in a cake makes it come alive. We love it!